I'm all about dresses that can be styled for any ocassion, and this one certainly fits the bill. What I love most about this dress is that it looks just as stylish when accessorized (perfect for work) as it does when worn alone (on lazy weekends). The chambray is quintessentially cool, while the fit of the dress is tailored but simple. I've surprised myself this summer by being enamored with yellow. I love it in a summery dress or as a pop of color- so I couldn't help pairing this necklace (perhaps my favorite find of the summer) with a belt in the same hue. 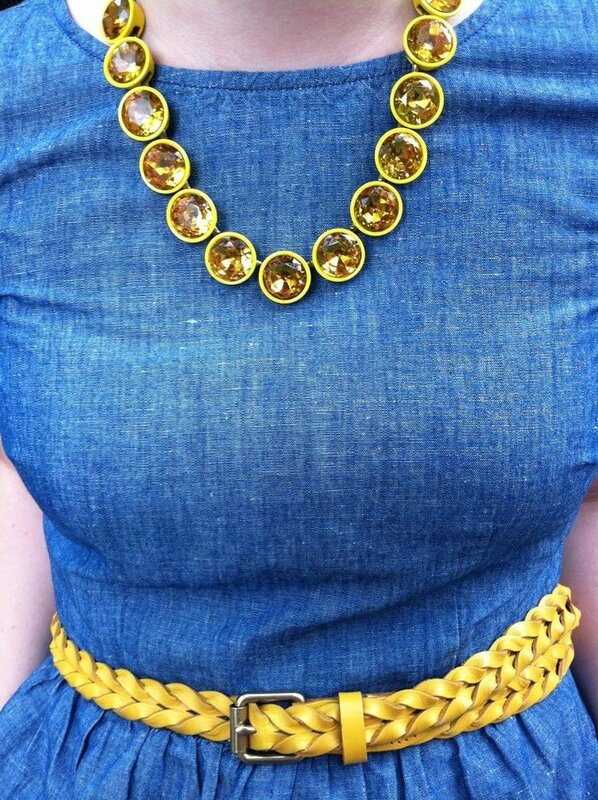 how very jcrew of you to like pops of yellow :) but seriously, I love how chic & easygoing this outfit is. the cut of the dress almost has a retro feel to it- love! The color combination is so, so pretty. I feel the same way about yellow -- it's not a color that I normally gravitate to, so this summer it's been nice to use it as an accent. So pretty, beautiful dress and lovely pics.